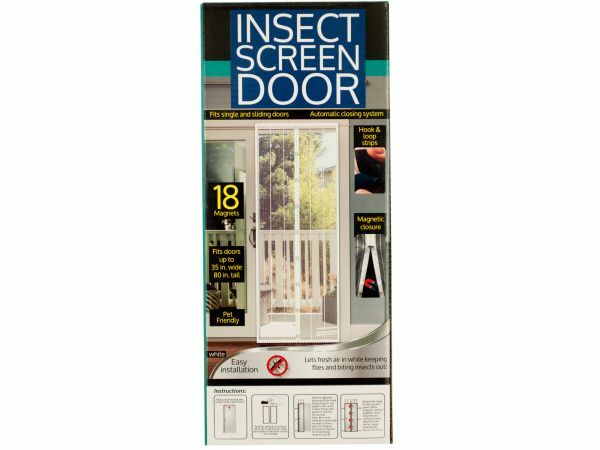 Let fresh air in while keeping flies and biting insects out with this Insect Screen Door featuring a white fine mesh screen with a magnetic closure and hook and loop strips. Magnetic closure with 18 magnets creates an automatic closing system. Fits single and sliding doors up to 80 tall x 35 wide. Pet friendly. Easy installation. Instructions included on package. Comes packaged in an individual box. Box measures approximately 5.25 x 2.25 x 12.25.